In the mint records, twenty-five proof shield nickel strikings are recorded for January, 1867. Most reference books have assumed that these original twenty-five strikes were the "With Rays" variety. As a result, the 1867 With Rays proof has long been considered a major U.S. rarity and its price at auction reflects that - many tens of thousands of dollars in recent years. Recently Douglas L. Kurz and John Dannreuther concluded an investigation which casts serious doubt upon the accuracy of the long held assumption that these initial twenty-five proof strikes were the "With Rays" variety. Doug has written an article on the subject (originally for Coin World), and given me permission to reproduce it here, in its full, uncut version. The With Rays proof appears at auction with great regularity - seemingly far too often to support a claim that a maximum of twenty-five pieces are extant. It is well accepted (based on die state evidence) that restrikes of the With Rays proof were coined at several later dates. With the discovery of the original proofs described in this article, the 1867 With Rays proofs are cast in an even more dubious light. In the December 1, 2003 issue of Coin World, John Dannreuther cited the "smoking gun" evidence that I provided to him regarding the 25 proof nickels delivered on February 8th, 1867 (Feb. 5th per R.W. Julian). I would like to provide readers with a more detailed description of this discovery, so that collectors will know how to search for additional surviving examples of these original 25 No Rays proofs. 3) There is substantial recutting on the left side of the knob of the 5, and its upper left corner. Breen describes this reverse die (cf. 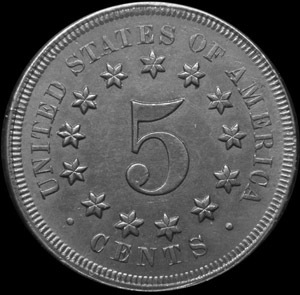 Encyclopedia of United States and Colonial Proof Coins, remarks under 1866, Transitional Shield Nickel) as a "prototype die without rays, recut 5, two center dots." Concerning this reverse die, John J. Ford, at New Netherlands Sale 61, 6/70, stated, "This reverse is unknown on any 1867-1869 proofs or business strikes." However, in June 2002 I discovered an 1867 No Rays proof struck with this prototype reverse die (NGC PF65, cert # 586933-003). I immediately recognized the reverse as being the transitional pattern reverse normally found on the J-507, J-509, and some J-573 patterns (cf. Pollock P-649). At the time, the coin was considered to be unique, and possibly a pattern striking. Prior to this discovery, all known 1867 No Rays proofs had the regular reverse (Fletcher's Reverse Hub IIa). 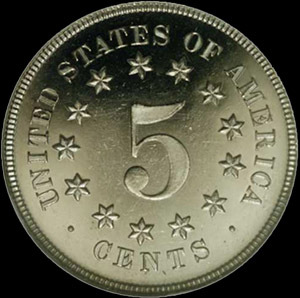 The only known examples of the 1867 obverse paired with the prototype reverse were the Pollock-649 copper strikings (Judd-573 in part). More recently, I acquired a second example from the Stack's "Randolph Rothschild" auction (10/15/2003:1006). This latter example comes from the complete 1867 silver and minor proof set ex Garrett Collection, sold at Stack's Garrett Sale (3/12/1976:301), and resold at the recent Stack's Rothschild Sale as individual lots. At my request, John Dannreuther was kind enough to examine the Garrett coin. Based on the obverse die state, John was able to confirm my suspicion that this coin was indeed a very early striking, earlier than the "original" With Rays proofs. This die pairing may likely represent the first 25 pieces delivered. This conclusion would likely confirm Bob Julian's research that the 25 coins of early February 1867 were No Rays proofs. It also thus lends more weight to the suggestion that the 1867 With Rays proofs were unofficial strikings made as delicacies for collectors, rather than part of the official deliveries of proofs. The Garrett coin now resides in an NGC holder, # 2018167-001, as PF65 CAM. The coin is also attributed on the insert as "1867 No Rays Prototype Reverse, FS-1867-1001, ex Garrett." The FS designation is a new format of variety number assigned by author J.T. Stanton of The Cherrypicker's Guide to Die Varieties. Stanton agreed to assign a variety number to this important die pairing upon learning of its discovery. Two further examples of these "original" No Rays proofs were auctioned by Heritage in their New York City Signature Sale of 11/8/2003 as lots 5603 (NGC PF65 # 286215-001) and 5627 (PCGS PR65 CAM # 21346026). Some lucky buyers acquired those rare pieces at no premium!! A further specimen was offered in Heritage's January 2004 Long Beach Signature Sale, as lot 5374. This coin is graded PF66* CAM by NGC, and may be the finest extant specimen of this variety. Thus the census of known specimens was five pieces as of January 2004. I have examined many dozens of other 1867 No Rays proofs, including many auction records, and have located no other examples with the prototype reverse. All 1867 No Rays proofs struck subsequent to the February delivery are believed to have the regular reverse. All proofs with the regular reverse are found with a later obverse die state. Based on total reported mintage, we can conclude that only one in 25 to 30 examples will exhibit the rare original die pairing. Anyone who owns an 1867 proof nickel is encouraged to check the star placement on the reverse!! This coin now represents a third type of 1867 proof nickel, as it bears not merely a different reverse die, but a different reverse design layout from the usual 1867 No Rays proofs. We now know that there are 1867 With Rays, 1867 prototype No Rays, and 1867 regular No Rays proof nickels. The emission sequence appears to have been: 1867 No Rays proofs with the prototype reverse, some 1867 With Rays "original" proofs, 1867 No Rays proofs with the regular reverse (perhaps with additional Rays proofs interspersed), then later restrikes of the Rays proofs, some with a second obverse die as reported by John Dannreuther. The rarest 1867 proof nickel variety is not the variety With Rays, but rather the original proofs with a star pointing directly to the midpoint of the first "A" in AMERICA. This page copyright © 2005 by Douglas Kurz and Howard Spindel. All rights reserved.